Fishing enthusiasts may wonder if the maggots they use as bait would be suitable to feed their aquarium fish. The answer is yes! Maggots should not be the primary food for your aquarium fish, but they make an excellent supplement. Fishermen will purchase different types of maggots based on the time of year, water conditions, and type of fish for which they are fishing. When using maggots to feed aquarium fish, the primary consideration is the size of the maggot. White Maggots (Spikes) - Ordinary white maggots, also called spikes, are the largest maggot sold, reaching three-quarters of an inch in size. They are the larvae of the Blue Bottle Fly. Dyed Maggots – White maggots are often dyed to enhance their attractiveness to the fish. However, not all dyes are safe for fish to eat. To be on the safe side, avoid using dyed maggots as aquarium fish food. Pinkies - Not to be confused with dyed white maggots, pinkies are naturally pink in color. They are the larvae of the Green Bottle Fly, and generally about half the size of their white counterparts. Squats – White in color, squats are the larvae of the common housefly and are the smallest maggot offered for sale. They are a great size for aquarium fish, but not as often found for sale as the large maggots. Maggots are readily found at bait shops. Many areas of the country have bait shops open year round. If you aren’t blessed with a year-round bait shop, or perhaps don’t have a bait shop nearby at all, maggots are also available online. Often online sites will offer other products, such as wax worms and nightcrawlers, which can be safely fed to your aquarium fish as supplemental food. It is also possible to culture you own maggots. However, given the availability of maggots for sale, and the fact that they should only be used as supplemental food, I don’t recommend culturing them. When purchasing maggots, they should be soft to the touch, as they age they get firmer. White maggots will have a dark spot – the larger this spot is, the younger the maggot is. Maggots are larvae and will either die or, if fed, mature into flies in a relatively short time. This could be within just a few days or as long as two weeks, depending on the age of the maggot and the temperature they are kept at. Storing maggots in the refrigerator will extend the length of time before they mature. 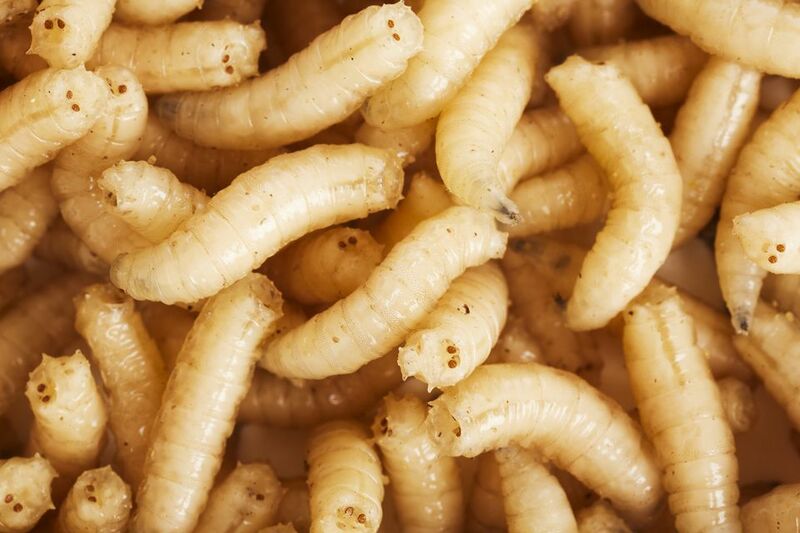 Most maggots are sold in a container of sawdust or maize flour to keep them dry. Their bedding should be changed every day or two to keep them healthy until used. Very small maggots are usually sold in damp sand. They will only keep for a few days and should be used as quickly as possible. If you find you have too many maggots to feed your fish before going bad, they may be fed to wild birds. Maggots are an excellent high protein supplemental food. However, they do have higher fat levels than other foods, and should not be used as the primary food source for aquarium fish. A couple of supplemental feedings every week or two is not a problem. Maggots may also be used when conditioning breeder pairs. Keep in mind that even though many fish enjoy maggots, not all fish will eat them. How Much (and How Often) Should I Feed My Aquarium Fish?